Of the many architectural and historic attractions in Beijing, the city's Christian churches may not be on the regular tourist agenda, but they are well worth a tour. Christianity was first introduced into China the 7th century. The first Protestant missionaries came in 1807. The efforts of Western missionaries to spread Christianity in China reached a peak at the dawn of the 20th Century and were concurrent with incursions by the imperialist powers which semi-colonized parts of the country. Many Christian institutions established beachheads throughout China, building churches, schools and other institutions. Most Beijing churches were built during the Qing Dynasty (1644-1911) and have been refurbished many times. Zhongguancun Christian Church is perhaps an unlikely looking church, but its tall minimalist modern building fits in perfectly on a street lined with skyscrapers in this Chinese Silicon Valley district, home of the country's technology giants and prestigious universities. 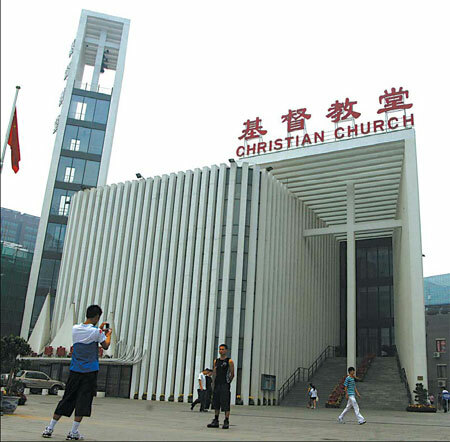 Designed by GMP International GmbH, a German architectural firm, this newly built Haidian District protestant church was only put into service last summer. Parishioners donated 6 million yuan ($822,000) for the building, which has modern acoustics, film projection and lighting systems. Ringed by white vertical posts which allow light into the building, parishioners enter by walking under a huge white cross in front of the door. This building replaces the old church which was built in 1933. Unlike other Christian churches at the time, it was the only church in the city built and managed by Chinese Christians. The old structure instilled a sense of national pride in the people because China was still semi-colonized at the time, according to Liu Zhen, who lives near the church. "The old church should have been preserved as a cultural site because it's an important part of history," he said. The demographics of parishioners have changed since the old days. Up to 70 percent of the church's parishioners are young people from nearby universities and leading IT companies. The increasing number of young believers created the need for additional pastoral counseling on topics that are interesting to youth, such as love and marriage. Even the musical accompaniment during services has changed. Instead of just piano, the church sometimes uses guitars and drums during services. The Wangfujing Catholic Church is nestled in the midst of the department stores, fancy boutiques and hubbub of the busiest commercial streets in the city. The plot on which the church stands today was once a traditional courtyard house designated by Qing Emperor Shunzhi to two Catholic missionaries in 1655. The two built a church instead, the second one in Beijing. The building was destroyed a few times over the years due to earthquake and fire. Rebuilt in 1904, the graceful Romanesque structure stands on a relatively spacious piece land in this costly district of downtown Beijing. After the wall surrounding the church was demolished a few years ago, the square before its entrance has become a public park, where nearby residents walk at night; newly-weds take photos and children practice roller skating. The favorite church for the city's youngsters would probably be Xishiku Catholic Church because of its Gothic style building which is encircled by a white marble wall. It is the biggest Catholic Church in Beijing. Its architecture is a blend of western Gothic style and traditional Chinese imperial garden style. Chinese lions stand on top of white marble pillars of the garden wall while statues of the Catholic saints stand in niches in the outer walls of the church. These days, many fashionable young people like to hold their weddings in the church, even though many of them are non-believers. 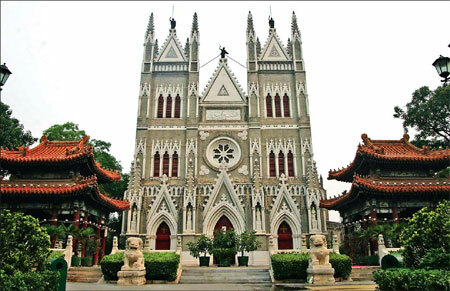 Built in 1901 by a French missionary, the church is located in Dongjiaominxiang, which evolved into the main diplomatic enclave and international concession in Beijing after the soldiers from eight imperialist nations ravaged Beijing in 1900. After 1949, the countries that established diplomatic relations with New China first opened their embassies in Dongjiaominxiang but started to move out of the area in 1959. The church, however, remained and underwent a major renovation in 1986. Gao Hong, the church's priest, participated in the Beijing leg of the Olympic torch relay last Wednesday. "I am a Chinese and the Games are all about participation," he said. A favorite among diplomats working in Beijing, this Protestant church holds services in English. It has also attracted foreign dignitaries and celebrities, including former US President Bill Clinton. With stained glass windows, it was built as an American Methodist Church in 1870. Called Asbury Church, its scale was quite small, designed to hold only 400 to 500 people. As the number of parishioners increased, the Methodist church began its expansion and the new building was completed in 1882. During the Yihetuan Movement (Boxer Rebellion) of 1900, the church was burned down. In 1902, the Qing Dynasty Government appropriated money to rebuild it and it was completed in the spring of 1904. Most churches in Beijing still retain their original architectural style, and Xuanwumen Catholic Church is no exception. Now the seat of the Diocese of Beijing, it is the church where Bishop Li Shan celebrates Mass. The gothic style church was built in 1605 under the auspices of the Italian Jesuit priest and missionary Matteo Ricci and expanded in 1650 by the German Jesuit missionary Johann Adam Schall von Bell. one that celebrates two Masses in English. Like the Chongwenmen Protestant Church, this Catholic church is often visited by foreign dignitaries. With some 5,000 regular parishioners, the Gangwashi Christian Church holds four Masses on Sundays. It was first rented for a hospital by the Christian and Missionary Alliance of London in 1863, and also used for religious services. In 1903, alliance members bought more land from a local landlord for expansion. In 1922, it was rebuilt and members joined the Chinese Christian Society. The complex included a church, a hospital and a school. Its services stopped during the "cultural revolution" (1966-1976) but resumed in 1986. In 1989, South Korean Christians in Beijing began to use the church for their own services.